HONG KONG 3 November 2017 – South China Morning Post Publishers Limited, Asia’s leading media company, has won four Gold awards, two Silvers and a Bronze at the Asian Digital Media Awards 2017, announced on Wednesday (1 Nov) in Singapore. Organised by the World Association of Newspapers and News Publishers (WAN-IFRA), the Asian Digital Media Awards recognise and showcase media organisations for their benchmarking use of digital media and innovative content to engage readers. More than 50 media companies across Asia vied for the industry honours over various digital media categories. 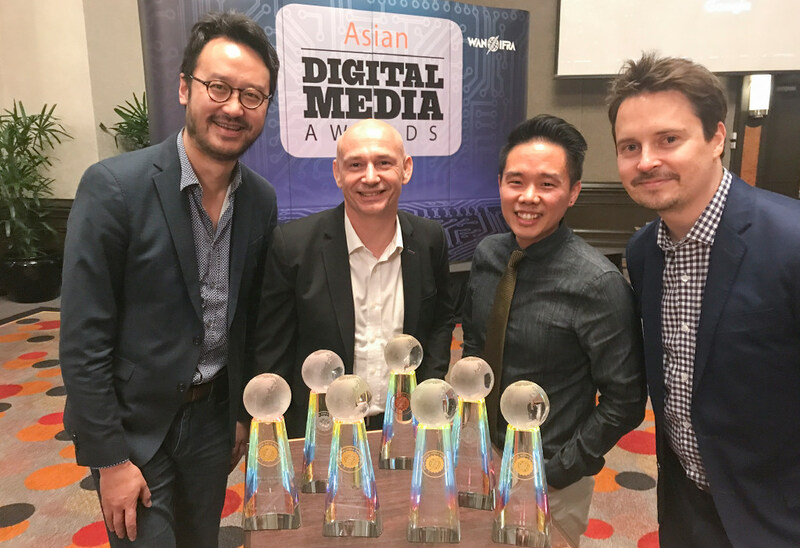 (From left) Chow Chung-yan, SCMP Executive Editor; Darren Long, SCMP Head of Graphics; Malcolm Ong, SCMP Head of Product; and Ben Abbotts, Director, SCMP Digital Product Development, receive the awards at the Asian Digital Media Awards 2017 in Singapore. These accolades follow the coveted Best Data Visualisation award that the SCMP Graphics team won at the World Digital Media Awards last month in Berlin. As recently as 2013, the SCMP has since amassed over 500 awards, including regional and international awards such as the above-mentioned World Digital Media Awards, the International News Media Association (INMA) Global Media Awards, the Malofiej International Infographics Awards, Society for News Design (SND) Awards, PANPA Newspaper of the Year Awards and the Society of Publishers in Asia (SOPA) Awards, among others – cementing SCMP’s position as Hong Kong’s most awarded media company. The Asian Digital Media Awards 2017 were jointly presented by Google and WAN-IFRA, the global organisation of the world’s press. First published in 1903, the newspaper has developed an enviable reputation for authoritative, influential and independent reporting on Hong Kong, China and the rest of Asia. Available in print, mobile, tablets and online through scmp.com and e-reader editions, the South China Morning Post reaches a global audience with daily breaking news, analysis and opinion, multimedia articles and interactive forums. The South China Morning Post received 200 awards in 2016-17 for excellence in editorial, marketing and technical capabilities. Other titles in the company include the Sunday Morning Post, STYLE and The PEAK.